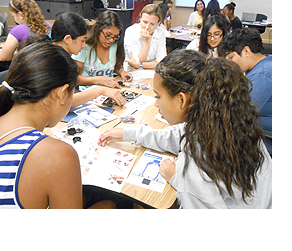 Through a partnership with BEWiSE (Better Education for Women in Science & Engineering), this 3-day energy academy camp engages ninth and tenth grade girls in science, technology, engineering and math (STEM) learning experiences while exposing them to various engineering roles at SDG&E. The program includes members from the Society of Women Engineers (SWE) who serve as mentors to the girls and teach them about energy efficiency, sustainability, renewable energy, and transmission and distribution. The final day includes a luncheon with several SDG&E women engineers who talk about their careers in the energy industry and college experience. An annual camp sponsored in part by San Diego Gas & Electric (SDG&E), that provides a fun and engaging educational experience for third-through-eighth-graders. It’s is a concept developed by the National Society of Black Engineers (NSBE) to increase students’ aptitude in math and science as well as their interest in pursuing science, technology, engineering, and math (STEM) career fields, by having them engage in interactive, team-based engineering projects. The camp is facilitated by collegiate students who serve as mentors to the students. The program utilizes a hands-on design curriculum which requires students to work in teams, use their knowledge to solve problems and create products while discovering the underlying math and science principles involved in these processes. Each week the students take on a new project, culminating with a presentation, design competition and physical competitions that all parents are encouraged to attend. Click here to watch a video of the SEEK Camp. A science and math camp designed to develop interest, excitement, and self-confidence in young women entering eighth grade. It features hands-on activities in math, science, and related fields.